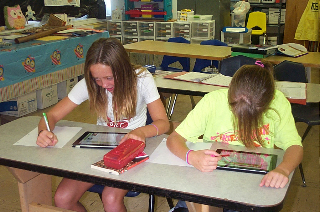 Mrs. Polak's reading class has done research on the country of Pakistan using the wireless iPads. They went to several different sites and found information suggested by the reading materials, as well as other interesting facts they hadn't expected. Here are Katie Mounce and Kelsey Bigelow hard at work. The book they are reading in class is Iqbal by Francesco D'Adamo. Mrs. Polak has been using the new technology available in the Milligan building in a variety of ways. Every morning the 6th grade has a "Question of the Day". 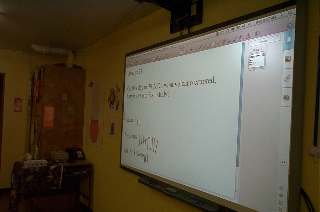 They place their tally marks on the SmartBoard next to the answer they choose. then they make fractions using those totals out of all participating. 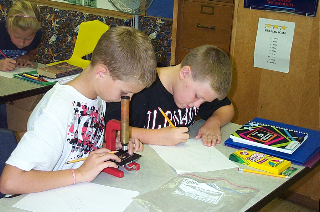 The fifth grade used the Magi-scopes to examine roots, stems, and leaves during their study of plants and plant parts. Here we see Mitchell Manning and Theron Odvody working on a celery leaf that has veins colored red by soaking the whole stalk in red food coloring. They can see that leaves have vascular tissues.